"No one can stop me. The only thing that can stop me is if something happens to me in the desert...if someone shoots me at the border...if someone says, 'this is it.' My only mistake is that I wasn't born an American, that I don't have the permission to be an American." — Jorge. This is part I of a podcast I edited and co-produced in December 2017 for a graduate-level anthropology of the border class taught by Dr. Linda Green at the University of Arizona.We visited El Comedor, a soup kitchen ran by the Kino Border Initiative in Nogales, Sonora for people recently deported from the United States. After breakfast, Jorge approached us and shared his story. Estefany has many scars—some are visible on her face—lifelong reminders of the death threats and abuse she survived in Honduras. She has short, curly black hair. Her brown eyes are round and wide. She wears bright pink lipstick, and her lashes stretch all the way up to her eyebrows. Estefany, along with 15 transgender women and gay men from Guatemala, El Salvador, Honduras, Nicaragua and México, arrived to Nogales, Sonora on July 25. One person joined the caravan days later. The Rainbow 17 — that’s what supports have nicknamed the first trans-gay migrant caravan — crossed many borders, exposing the violence inflicted on LGBTQ people in Latin America, and the abuse and exploitation of Central American migrants in México. This radio story aired and published in September 2017 on Arizona Public Media, the Tucson NPR affiliate. It is a small portion of a larger project I have been working on for more than one year. The complete project will publish in NACLA Report on the Americas’ winter 2018 issue, Women Rising in the Americas. Read and listen to the story here. Rosa Robles Loreto in her bedroom at Southside Presbyterian Church, where she lived in sanctuary for more than one year. For Rosa Robles Loreto, January was the roughest month out of the now six she's been living in sanctuary at Tucson's Southside Presbyterian Church. The mental and emotional strains of not being home with her husband and two boys, and witnessing her case with the Department of Homeland Security remain static—it's catching up to her. Not that it wasn't a burden before, but living in the church for half a year makes her very nervous. "I pray to God ... I say, 'If it is still not my time to leave here, please give me strength so that I can transmit that to my children and my husband,'" she says on this rainy and gray Saturday afternoon. Her husband, Gerardo, and two sons, Gerardo Jr., 11, and José Emiliano, 8, were out running errands for mom. Robles Loreto was anxious for them to return. Lately, that uneasiness is constant. "My God, will it be another six months?" she says. When Robles Loreto walked through Southside's wooden-carved doors on Aug. 7, 2014, escaping deportation, she thought she'd be staying for maybe a little over a week. She even requested 10 days off at the homes she worked for years as a housekeeper. It's February, and DHS and Immigration and Customs Enforcement haven't lifted a finger to kill her deportation order. This article was first published in the Tucson Weekly’s Feb. 5, 2015 issue. Read the entire story here. Rosa Robles Loreto with her two sons, Gerardo Jr., right, and José Emiliano, left. Her boys moved in with her at the church during their summer break. Robles Loreto announced Immigration and Customs Enforcement closed her case on Nov. 11, 2015. She left sanctuary shortly after. Rosa Robles Loreto says the first thing she is going to do after leaving sanctuary is walk around her house and cook dinner for her husband and two boys. This morning, Robles Loreto celebrated a huge win: days after her attorney Margo Cowan worked out a confidential agreement with Immigration and Customs Enforcement officials, Robles Loreto walked out of Tucson's Southside Presbyterian Church—the place she called home for more than 15 months to avoid deportation. "I have been crying all of these days. My children, when they heard the news, their faces just changed," Robles Loreto told the Weekly after a quick prayer and ceremony inside the church's worship room. "I thought my (youngest) son was going to jump with happiness, but no, he just cried and hugged me." Robles Loreto's oldest son, Gerardo Jr., 12, says he can't wait for his mom to once again cheer for him from the sidelines at his baseball games. He, and younger brother José Emiliano, 9, spent the summer vacation at the church with mom, leaving her side only for baseball practice. When the Weekly spoke with Gerardo Jr. a few months ago, he said sometimes he would forget his mom wasn't around. He'd come back home from school screaming for her to talk about his day. Then, he'd remember she wasn't there. "I am really happy because I wasn't expecting it, I am very grateful...I am happy that she is safe," Gerardo Jr. says. "(I want to) spend time with her and go to my baseball games, and go to the park." This article first published in November 2015 on the Tucson Weekly. Read the entire story here. This article first published as a cover story in the Tucson Weekly’s July 28, 2016 issue. Read the rest here. After speaking up against Tucson Unified School District’s decision to continue cutting back its already-watered down Ethnic Studies program, which included Mexican American Studies classes, Cholla High School teacher Corey Jones was suspended. It's 8:50 a.m. on a Friday, and this Cholla Magnet High School classroom starts filling up with students' chatter. Their professor, Corey Jones, greets each student one by one as they walk in—hand shakes, pats on the back. Before the school announcements, Jones asks his kids to arrange their desks in a circle; that's the seatting chart of choice for his culturally relevant U.S. history from a Mexican-American perspective course. "Let's begin," he says. The young teacher starts clapping. His students join in, creating a crescendo. They call it, "the unity clap." It's how they begin and wrap up their lessons and discussions. The teens—mostly but not entirely Chicanos and Chicanas—are enthusiastic to learn about the conquest, slavery, and all other tales of oppression and success that have occurred on American soil from the points of view of the victims and the victors. From their mouths: This class makes me want to come to school. Since Jan. 2, national, statewide and local magnifying glasses have been placed above this classroom, a few others at Cholla, some at Tucson and Pueblo high schools, and the entire Tucson Unified School District's culturally relevant curriculum. Soon, as agreed upon by new state Superintendent of Public Instruction Diane Douglas, and TUSD Superintendent H.T. Sanchez, representatives of the Arizona Department of Education will be scheduling visits to these learning spaces, as the two entities try to fix alleged violations of A.R.S. 15-112, the 2010 law signed by former governor Jan Brewer that ended up outlawing the Mexican-American studies program two years later. This article first published in the Tucson Weekly’s Jan. 15, 2015 issue. Read the entire story here. After exclusively speaking with me about this issue, Jones became a TUSD whistleblower. Read more about that here. Enrique Santiz begins to cry when he thinks about the last days of school with his students—all between 10 and 11 years old. He wonders about their future. The mostly indigenous boys and girls come from impoverished small towns around the region of San Cristobal de las Casas in the southern Mexican state of Chiapas. It's difficult for Santiz to let go of his adoptive 35-plus children—off to the hands of another educator who'll continue to mold their minds. Santiz was born in a small village about 25 miles outside San Cristobal de las Casas. At age five, his parents sent him to live with an older couple in San Cristobal so that Santiz could go to school and hopefully build a better economic foundation than his parents could ever provide. "My mom—she passed away two months ago—would say that when I was three or four years old, I'd tell her that I wanted to go to San Cristobal de las Casas to eat bread and shrimp," he says. It would have been a luxury. "[The couple] practically adopted me as their son. I stayed there. I graduated from high school...it was the eagerness to do greater things." For many men and women in Santiz's community, attending school is a reality mostly only if you have light skin. Santiz's teachers sparked his awareness, and created a fire in him stronger than any social challenges that might've otherwise forced him down. He had to become that teaching force for other generations. "The boys and girls, they see you as part of the family," Santiz says. "The hours we share together are beautiful. The ideas that I teach are not 'be a rebel against everyone and everything.' They are an analysis of their situation and what their future could be like. "As a teacher, you have to explain that reality," he continues. "It is not influencing rebellion, rather giving them a vision for which to live by. 'How do you visualize yourself when you graduate high school?' From that reflection, they realize their social and economic situation. Based on that reality, they understand that they have to work harder." He's been living in a teachers' union camp in Mexico City for nearly a month as a form of protest against the country's neoliberal education reform. His wife is also staying there. It's a cloudy Friday afternoon in the middle of July. Santiz sits on a plastic chair eating recently-cooked refried beans and rice with a couple of compañeros. There are dozens and dozens of tents in the surroundings; a small living room in the middle of the camp with donated furniture and a microwave that serves as a coffee table. It's been uncomfortable to sleep on wooden pallets, protected only by a massive tent held together by rope and made of long, thick multicolored pieces of plastic fabric. The camp is split into different states—Oaxaca, Guerrero, Michoacán, Chiapas and even Sonora. It is day 23 for Santiz. He has been here since mid-June. He is with his brothers and sisters—fellow educators—in what's been a months-long demonstration in Mexico City against the federal government's violent implementation of a 2013 education reform. The friction between the magisterial movement and the government has been burning for decades, though. This story first published in the Tucson Weekly’s July 21, 2016 issue. I wrote the article, while reporting from Mexico City. Read the rest of the article here. Cesar Leyva in Sonoyta, Sonora, as close as he could get to the U.S.-Mexico border. In April, Immigration and Customs Enforcement officials apprehended Leyva in Tucson at approximately 3 p.m. By 6 p.m., he was turned over to Mexican authorities in Nogales, Sonora. He hadn't been to his native country in more than a decade. "Imagine heading to the bank to cash a check, I get pulled over, three hours later I am in Mexico," he says in Spanish, sitting at a coffee shop in Sonoyta, Sonora, across the border from Lukeville, Arizona, which is as close as he can get to his past life at the moment. "I hadn't been in Mexico in 13 years. It was a terrible shock." He stayed in Nogales for a week, while his brothers dropped off a few belongings, before heading to Puerto Peñasco. Leyva says he had never visited the small beach town, but a cousin he is close with lived there, so it seemed like a good choice for a temporary home. Half a year later, it still doesn't feel real. He hasn't explored his new surroundings much, or gotten to know any of the locals, because he's so determined to come back to the life he built since immigrating to the U.S. in 2002. This article first published as a cover story in the Tucson Weekly’s Nov. 9, 2015 issue. Read the rest here. Last Thursday morning, after a quiet, one-week stay in sanctuary at a Tucson church, Daniel Neyoy-Ruiz celebrated Immigration and Customs Enforcement's decision to grant him relief from deportation for one year ... again. The June 2014 stay of his removal case had expired Tuesday, June 9, and Neyoy-Ruiz anxiously awaited ICE's ruling on whether the agency would extend it another year. He and his lawyer filed a new application. The next day he moved into the church, as a preventative move. Being deported to Mexico after 15 years, away from his wife and 14-year-old son will not, ever, be up for consideration. "They have to realize that they are separating families. What they are doing is grave," he said last Wednesday. In between words he played a few notes on his Mexican-flag-colored accordion. His guitar case rested near his bed. He had also brought materials to paint, a hobby he picked up last time he was in sanctuary. "All (ICE) sees sometimes is an alien number, but that number has a heart, has a family, it's a person." A ceremony to officially welcome him into First Christian was planned for the following afternoon. But that turned out to be more of a celebration with family members, friends and supporters. The gathering wrapped up with a prayer by Pastor Ailsa Guardiola Gonzales. Neyoy-Ruiz bowed his head and held his son Carlos' hand. "It's a tragedy, this is something that affects our community," Guardiola Gonzalez said. "Being a strong community, a community of support of love for families, those opportunities are being stolen and it affects all of us." Neyoy-Ruiz was the first sanctuary case the church housed since the movement gained momentum in Tucson and around the country again. First Christian was also involved in the cases that emerged in the 1980s, when an influx of Central Americans made their way to the U.S., escaping from their civil-war-stricken countries at the time. This article first published in the Tucson Weekly’s June 25, 2015 issue. Read the entire story here. Dario Andrade Mendoza protesting at the University of Arizona. He and other undocumented students demanded in-state tuition as long-time residents of Arizona. Dario Andrade Mendoza graduated from high school and Pima Community College with honors. 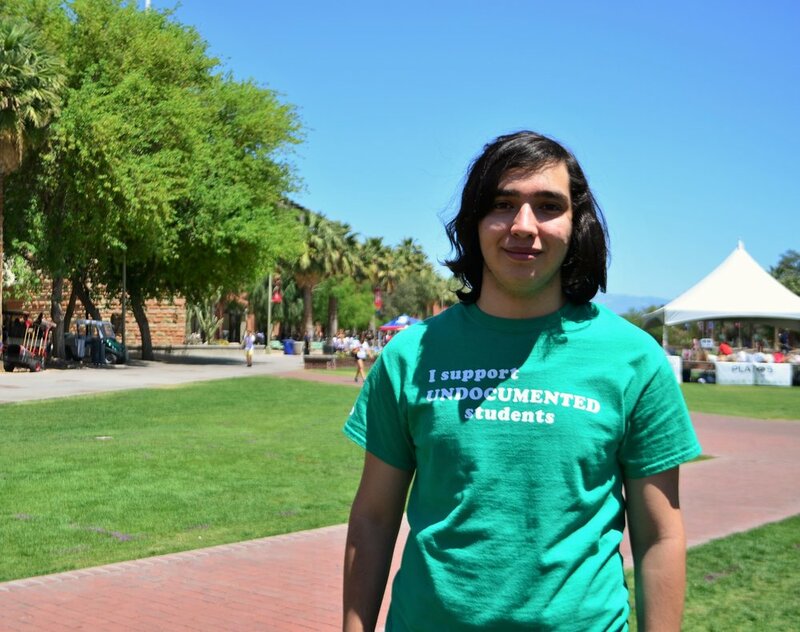 His interests lie in engineering, so, naturally, the next step was obvious: enrolling in the University of Arizona's College of Engineering and getting a degree—or several of them. In May 2014, right after he got an associate's from PCC, the 20-year-old applied to the UA. He was accepted as an honors student in the engineering college because of his outstanding grades. There was a problem, though. Andrade Mendoza is a DACA recipient, or DREAMer, so he has to pay out-of-state tuition at the UA, which is, as of now, about $29,000 plus fees per year, and bound to probably get more expensive with this year's tuition proposals. "I ended up not enrolling in any class because I cannot afford that," he says. Andrade Mendoza was among a group of DREAMers and allies who participated in a rally at the UA demanding they get in-state tuition. (The gathering was organized by Scholarships AZ.) "Throughout the four years of high school, my counselor promised me, 'Hey, you are going to get financial aid, the AIMS scholarship, you are going to get all of these scholarships.' So I thought, 'Oh, maybe I am going to go to college.'" On Monday, May 4, the Arizona Board of Regents is going to discuss making universities cheaper for DREAMers. The proposal is to reduce rates, so that they pay 150 percent of what a resident pays (if approved, DREAMers' tuition would be about $17,000). While it's a good start (and students are very grateful for it), it is still not equal, and the fight for tuition equity will continue, even if ABOR approves the 150 percent proposal. This article first published in the Tucson Weekly on April 29, 2015. Read the entire story here. Kirk feels lucky to be able to stand at the Ronstadt Transit Center on this Friday morning, as part of 530 other Sun Tran bus drivers and mechanics striking for fair pay, better security and a mold-free work environment. In November, Kirk was stabbed twice while on the job—once in the chest and another in the neck. A young man at the Roy Laos Transit Center attacked him, while he took a break from his night shift driving route 11. Kirk, who asked that we not share his last name, says there was only one security guard around. The young man hit the security guard in the head, and then went after Kirk. The neck wound could have been fatal, but the knife blade hit his collarbone. The stab in the chest didn't hit any vital organs, either. Kirk, a bus driver for the past six years, was off work for two weeks. "(Sun Tran's) management explained to me the process of going on workers compensation ... that is really all the interaction I had from them regarding this case," he says, sitting in the shade, holding a picket sign. That Friday marked the strike's ninth day. "There haven't been major changes in security." Shortly after his return, he had an altercation with a bus rider who snuck in a beer. The man ended up throwing the beer in Kirk's face, after Kirk asked him to get rid of it. "Passengers realize that there is no accountability ... the disrespect ... they don't have to abide by any rules," he says. All-in-all, there have been 22 assaults on bus drivers in the past 13 months, according to the Teamsters Local Union 104, which is leading the strike. That includes beer-throwing, spitting and more violent incidents. "When I am on my job, doing what I am supposed to be doing for a living, I should be entitled to protection, the company should be looking out for our safety," he says. "I feel it is not a priority of theirs." Kandi Young, Sun Tran's marketing and communications director, argues the company has worked side-by-side with the union to establish a safety committee, and have implemented the use of off-duty police officers on buses and at bus stations. Still, the assaults, wage woes, and a massive mold problem at a Sun Tran maintenance facility in northwest Tucson created the perfect storm. This article first published in the Tucson Weekly’s Aug. 20, 2015 issue. Read the entire story here. Holding on to the Dream: “I learned how to hide years before I learned how to ask for help.” Photo courtesy of the artist, Alejandro. It's been four years since undocumented youth were given some sort of legal recognition in the country. With Deferred Action for Childhood Arrivals, DREAMers, many of whom have called the U.S. home since they were toddlers, can be issued renewable two-year work permits and get temporary relief from deportation, as long as they pass a background check and meet a list of qualifications. 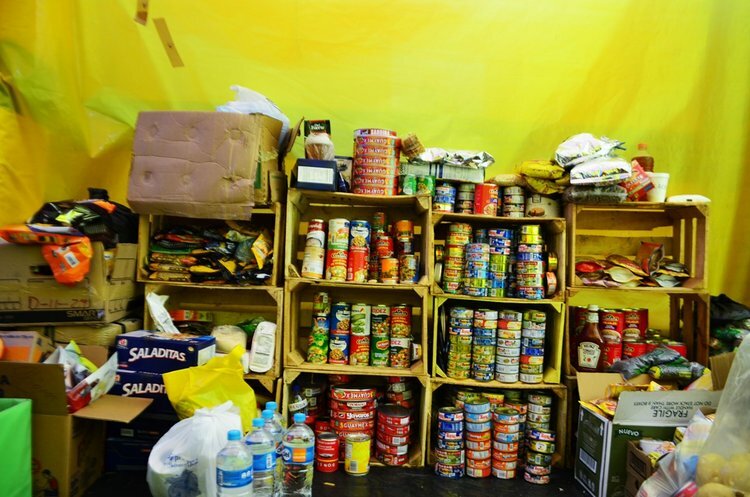 The program was enacted by President Barack Obama in June 2012, and to this day has helped more than 700,000 people. The benefits have been a two-way street in terms of economic opportunities for the country. There are more bodies and minds in the workforce, as well as in higher education institutions. Still, in Arizona, DREAMers were granted in-state tuition at public universities merely one year ago. (They still have to pay university costs out of pocket because they do not qualify for federal financial aid.) They couldn't get driver's licenses until December 2014, after a years-long legal battle with the state. And, even though DACAmented working youth pay taxes, they still can't get insurance through the Affordable Care Act's online marketplace and are ineligible for AHCCCS, the state's version of Medicaid. The photography exhibit and writing project "DACAmented Voices in Healthcare"—pieced together by Sofía Gómez, a doctoral candidate in policy and management at the UA Mel Enid Zuckerman College of Public Health, and a group of DACAmented young adults—is bringing the healthcare issue back into focus. The project highlights the limitations, but also the strength of a community—including LGBT DACAmented youth—that's continuously marginalized in an immigration limbo. This article first published in the Tucson Weekly’s June 23, 2016 issue. Read the entire story here. Jazmin Huguez, Eliot Ortega and volunteer Steve Johnston at Keep Tucson Together’s educational clinic at Pueblo High School. Despite a temporary block of President Barack Obama's 2014 immigration action, volunteers arrived at a weekly educational clinic at Pueblo High Magnet School last Thursday evening with an important message for more than 100 people seeking relief: Don't be discouraged and proceed with your plans to apply. This soothed Mexico native Jazmin Huguez, a mother of five children (four born in the U.S. and one soon-to-be DACA recipient), who's been gathering all the documents needed to go with her application for a three-year work permit, deportation deferral, and a Social Security card, granted to some parents of U.S. citizen and legal resident children thanks to what's nicknamed DAPA, the Deferred Action for Parents of Americans and Lawful Permanent Residents program Obama created last year. Those applications are not expected until some time in May. Huguez arrived to the Keep Tucson Together forum with her 19-year-old son, Eliot Ortega. There, longtime volunteer Steve Johnston, who's collaborated with Tucson immigration advocacy groups such as No More Deaths, helped the teen through the final steps to complete his DACA application. "I can't believe I will actually get a chance," said Ortega, as he meticulously fills out every line of the document. "I am glad to be here, and finally have an opportunity to fulfill my dream." He wants to take classes to become a personal trainer. Ortega, who was brought here by his parents when he was 2 years old, qualifies for the 2012 version of the program, which was not affected by a Texas federal judge's recent preliminary injunction stalling Obama's Nov. 20 immigration orders. Late last Monday, U.S. District Judge Andrew S. Hanen suspended the president's order while a lawsuit filed by a coalition of 26 states, including Arizona, seeking to gut the action is resolved. This article first published in the Tucson Weekly’s February 26, 2015 issue. Read the entire article here. Former governor of Arizona, Jan Brewer issued an executive order in 2012 denying undocumented youth with DACA the right to issue a driver’s license. It's been more than two years since President Barack Obama pissed off Gov. Jan Brewer when he relieved hundreds of thousands of undocumented young immigrants around the country from deportation, and gave them work permits and Social Security cards. Brewer responded by issuing her own executive action: None of them were to get driver's licenses in the state of Arizona. That saga ended two weeks ago, immediately allowing roughly 22,000 people under Obama's DACA program to start driving. Thanks to a preliminary injunction by U.S. District Judge David Campbell, so-called DREAMers like 21-year-old Francisco Salcido were able to step into any MVD and apply for a license starting Dec. 22. After working a graveyard shift at one of his two jobs, Salcido was asleep while his cellphone blew up with text messages with the news–the U.S. Supreme Court refused to keep blocking DREAMers from the road. "I go to my mom and I'm like, 'Mom, it's final, we are getting the licenses," he says. "I thought she was just going to congratulate me with her hand, but she pulled me in and gave me a big hug." Brewer and the DREAMers had been in a legal battle over this since 2012. Federal courts again and again ruled against the no licenses policy, saying the state's motives were not solid. Really, it made no sense to treat them differently from any other noncitizen, such as green card holders. That day three weeks ago, Salcido felt independent. He could get from point A to point B and C without fear. He plans to get his license ASAP, but his schedule is complicated. At least one aspect of his life in Tucson will get easier. He won't have to rely on carpooling or public transportation to get to his classes at Pima Community College or his security guard gig. Then, there's also his job tutoring Native American youth on the Tohono O'odham Nation. The Mexico native travels there a handful of times a week as part of a federal program, aiming to increase the high school graduation rate on tribal land and prepare students for higher education. This article first published in the Tucson Weekly’s December 30, 2014 issue. Read the entire story here.